I was thinking the other day about the first ever lunch box I packed for my son. Honestly I was a little nervous in the lead up to the first day of the little man’s school life. Just before he started school he went through a super shy / social freak out phase. Despite it eventually subsiding say after that first swim lesson of term or hour of a party, I wondered whether the first day of school would be really hard. I was braced and ready. We’d talked about how every single child there was having their first day and they were all going to be feeling excited and nervous and sometimes shy and that was totally cool. You wonder whether these things are going to sink in, don’t you? He was of course dressed when I got up at 6.20, completely ready for school – even his hat! I figured that was a good sign and it was. We walked down as a family. He got playing and building things, met the teacher and we had a cuddle and left. He was already ‘busy’. No tears or leg hugging from either of us and I found myself drinking a juice down the road quietly, thinking, how odd. It was as if it were so natural and normal yet all so new. Always have crudité veggies at hand – capsicum, carrot, cucumber, celery, cherry tomatoes and alternative to keep things different over a fortnight. Always cook too many meatballs, sausages, burger patties or drumsticks and use them for lunch boxes the next day- These nourishing meats with healthy fats and protein that burn slower are great at lunch time, resulting in more balanced blood sugar levels – one of the key things that affects concentration. Sausages especially, when I think of my little guy and how soon after a meal I get told “I’m HUNGRY”. 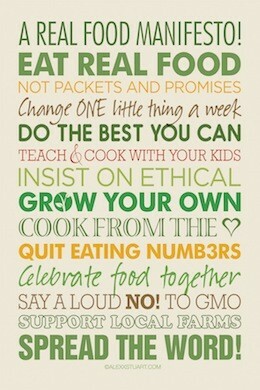 Go for ethical, organic and pasture raised wherever you can. Always cook too much roast veg like sweet potato or pumpkin – So yummy the next day in chunks, plain. Make 2 small batches of various dips, or a simple paté like mine or smash a half avocado with sea salt and press parchment down onto its surface so it doesn’t brown before lunch. A simple whole piece of fruit. Apple, a handful of strawberries, half a banana. 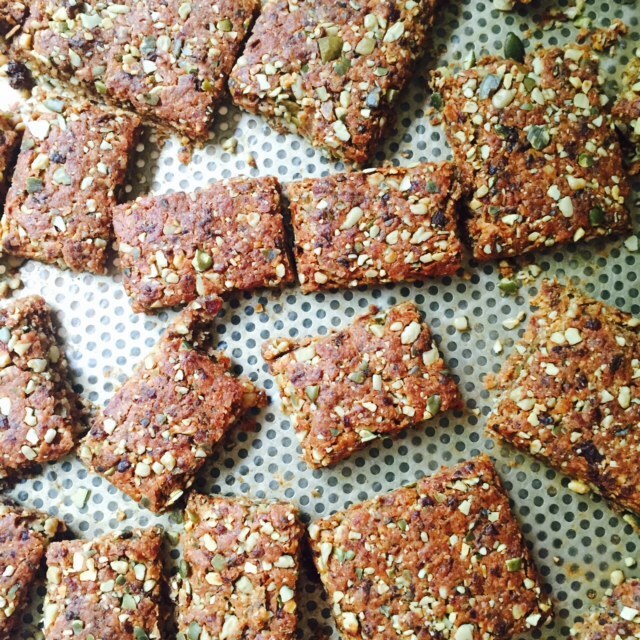 On a pate day seed or buckwheat crackers to enjoy it with. Then in terms of the lunch box itself… I seem to have ended up with two smallish ones, so in the end, it’s perfect for keeping recess and lunch separate. These are some of my favourites, all of which I’ve purchased with my own money and recommend because we have loved them for trips to the park, extended car trips, picnics and playdates over the past couple of years. DITCH PLASTIC wherever possible. 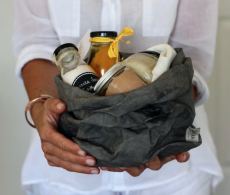 These are my shopping mottos – especially around food storage. In opting for stainless steel, you avoid exposure to hormone disrupting pthalates, BPA, BPS, PVC, DIOXIN… the list goes on. Detox the lunch box with these ones forever more and check out Biome for loads of other options too. If you do so throguh these links, you’re also supporting my work with a small commission, as I’m a super proud affiliate for Biome – one of the strictest ‘natural’ stores out there in terms of what they stock. So here was our low tox lunch box. The Apricot bars from my book Real Treats were a hit – always a crowd pleaser. And the result? Not bad at all mum. Not bad at all. Phew! Organic pasture raised pork sausage from the markets, fresh fruit, veggies and smashed avocado and the rest detailed above. 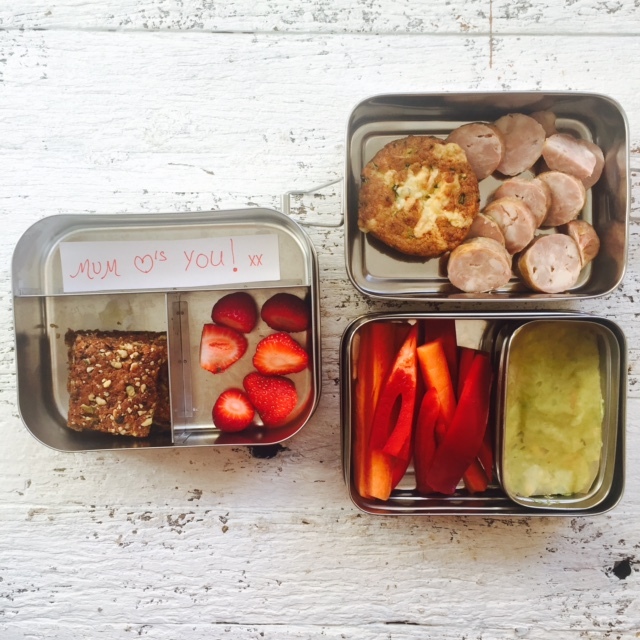 So what are your favourite lunch box foods for easy and nourishing options? What do your kids love? I am trying to come up with ideas other than sandwiches, this week the kids have had homemade sushi, fruit, roasted sweet potatoes, other vegie sticks, home baked goodies such as chocolate muffins made on spelt flour, marinya cottage ‘s apple, carrot and oat slice. My kids do like bread but I try to think of other foods that contains more nutrients. Hi Alexx! 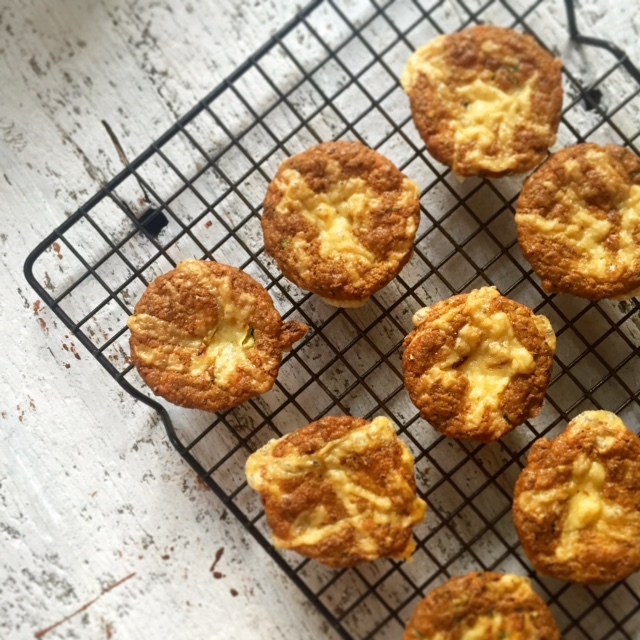 Thank you for an awesome post, I’m doing Kindy lunches for the first time :). I posted this comment over on Natural New Age Mum too, and I’d love to know your thoughts. In the lead up to starting Kindy, I’d been googling around about what to look for with stainless steel products i.e.. quality, grade etc. and read something about stainless steel that is manufactured in China being questionable to say the least (the article claims that China has a “proven track record of manufacturing steel products contaminated with everything from lead to cadmium, asbestos, Cobalt-60 and other radioactive wastes…” And apparently it’s way too expensive to manufacture elsewhere. I haven’t dug any deeper on this, it’s just one article I’ve come across. I’ve been keen on Planetbox and LunchBots so far, both of which are made in China…. Feels frustrating when sometimes there seems to be an ‘issue’ to come up against, every way you turn. Basically I just want the safest product in the land, but I’m probably just overthinking it I guess. These doubts are over cheap thin stainlesses. 18/10 is high quality and anti rust and you’ve nothing to worry about 🙂 – I know the stainless you mean. For me the most obvious sign is the stuff that rusts when wet. Quality, pure stainless shouldn’t and having put these lunch boxes through the dishwasher a number of times, I feel confident that we’ve nothing to worry about. Alexx I am loving this! 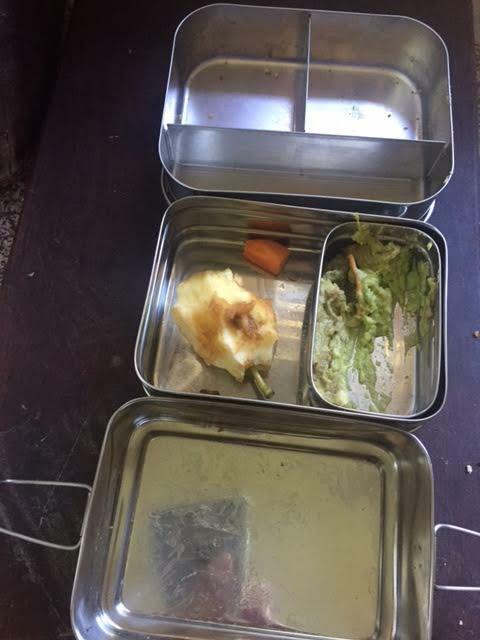 I dreaded lunch boxes all last year during our little man’s first year at school. I really needed this article from you and start the year fresh with new and more importantly healthy ideas. Thank you! Hi Alexx, did you need any cooling to keep things fresh through the day? I love your blog. 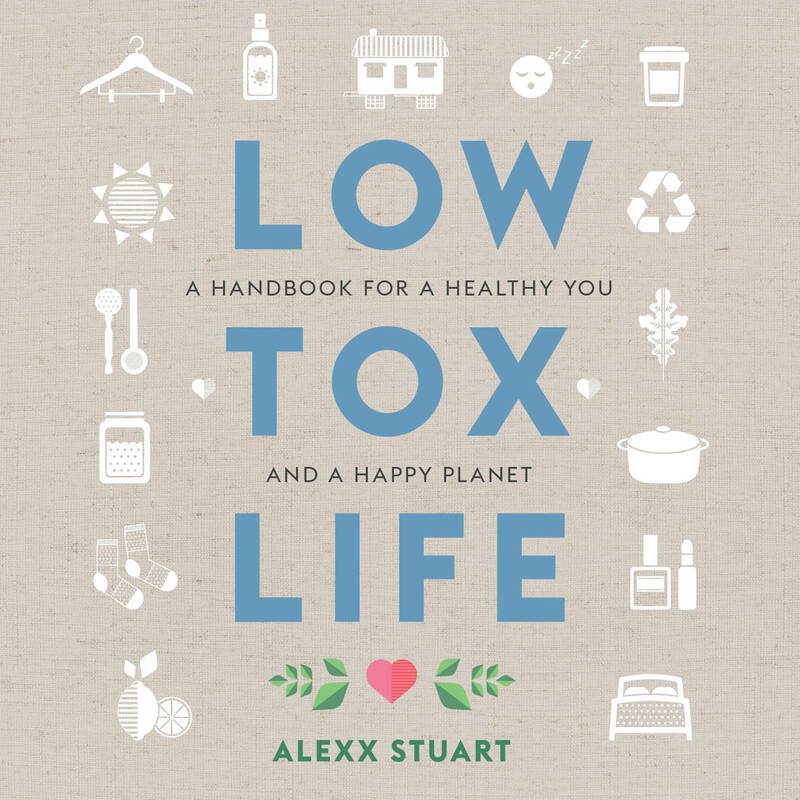 You’ve really helped me make huge but not overwhelming changes to live a healthier life. I provide my son with breakfast, two snacks and a lunch every day as he’s only two and in daycare. I have to follow the USDA food program and most of what I send him for lunch should be reheated. In order to make meal prep easier on my provider I use plastic bento boxes and I’m sure she microwaves the food in the boxes. I’m not keen on the microwave use either but it’s not my home so I don’t feel I can say much here. What is your solution for foods that should be warmed up? Do you just not send him with foods that need to be reheated? I doubt a school would throw his aluminum boxes into an oven for a few minutes and they can’t be microwaved…..I would love to switch to these when he’s older or even now but I feel like it’s more of an inconvenience for her and she’s doing me a favor by allowing me to bring his food (she serves all of the stuff you’re against on here). Just curious on your thoughts/actions regarding warm food at lunch. I know LIFE FACTORY brand is available in the US and they do a silicon protected glass – could that be an option? I LOVE the after shot!!!!!!! I have such anxiety about opening the lunch box after school!! I like the look of your lunch boxes but can only see the round ones….and with 3 lunch boxes, do you place them all in something to keep them together? Some days I will use leftoers and then other days, half a sandwich with something extra like cheese or hummus and vegie sticks so it’s good to have a few smaller boxes when you don’t always need a big one. and should I be using an ice brick as well with the stainless steel? Thanks!